Has anyone seen the new IKEA advert? - furry lite™ - Furtopia | Family Friendly Furry Forum and IRC Chat! 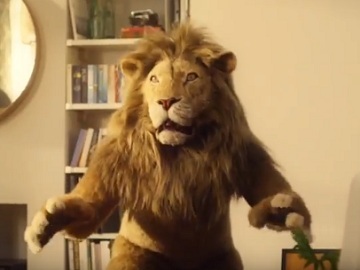 Has anyone seen the new IKEA advert with the lion in it? I really liked it, and the fursuit is great! Re: Has anyone seen the new IKEA advert? No, I haven't seen it. But now that you mention it, Thanks for sharing. Looks like a really good fursuit, especially the head. I'd be really curious to know what special effects or costume company made the suit. No seams at the wrist or ankle areas which I can see which means it's a one piece bodysuit with a seperate detachable headpiece. No large tearduct areas or other openings for the actor to see through the head. I'm guessing the actor would have to be very good at pantomime or other performance actions to act in a suit with little or no visibility. Might even be taking cues from the director off screen too with the director saying when to move the arms, when to stand, and so forth. I was disappointed at the scene of the lion drinking the juice. Bad way to ruin a costume. I hope the juice doesn't stain the fur too badly. It's just me chilling out. Awesome! Thanks for the heads up. I'm guessing the actor in the fursuit is very visually impaired. There's not much there to look through. That's what I mentioned before. No large tearduct areas or other openings for the actor to see through the head. I'm guessing the actor would have to be very good at pantomime or other performance actions to act in a suit with little or no visibility. Might even be taking cues from the director off screen too with the director saying when to move the arms, when to stand, and so forth.